Cross-sell and up-sell strategies are a common practice observed across industries for introducing customers to better or complimentary products. In mutual fund industry, cross-sell & up-sell is essentially the expansion of the portfolio of an investor through additional new or complementary products and services. In an industry where distributors are interacting with financial advisors regularly, cross-sell and up-sell strategies are effective ways of strengthening the distribution channel through information trickle down effects. Machine-driven algorithmic decision making platforms for recommending cross-sell and up-sell productsdeveloped on the information such as transaction behavior, demographic, and scheme features, for providing the next best product recommendation to an investor can bolster (and replace in the long-run) the existing human-driven decision making processes. With a six-fold growth in assets of the mutual fund industry in the recent years, the Asset Management Companies (AMCs) in India face an increasing amount of competitive pressure to their share of wallet. However, the increasing challenges arise not only in the area of acquiring new investors, but also in maintaining the vintage investors. The traditional penetration channels such as IFAs(Independent Financial Advisors) play a crucial role in maintaining the existing investor relationships as they interact with the investors on a regular basis. Forward guidance through predictive and association learning analytics for recommending the next best schemes/plans to the channel agents will increase the retention of the existing investors. In the contemporary system, due to the existence of extreme information asymmetry, the IFAs and other channels fail in identifying the precise scheme that could be sold to an existing investor. Recommendation analytics utilizes an organization’s data by applying sophisticated algorithmic techniques to mine patterns and insights from the raw data for cross-sell and up-sell strategies. These recommendations developed leveraging big data analytics platforms are investor-specific in nature. In the mutual fund industry, recommendation analytics can be applied to financial transaction data, demographic factors, and scheme level features, to analyze the areas such as the growth in the net assets under management and customer acquisition &retention, through efficient analytics platforms for prediction and optimization problems. Karvy’s in-house analytics team recently deployed a cross-sell and up-sell analytics platformwhere scientific pairing of mutual funds is carried out by predicting the nearest scheme to another for a particular investor, with the help of algorithms to identify the likelihood of a fund to be bought with another fund. The predictive recommendation model was based on factors such as the financial transaction behavior of an investor, his demographic factors, and the scheme-level features. The purpose of this white paper is to illustrate a few select capabilities of Karvy’s analytics domain in assisting the AMCs with respect to their investor behavior. Specifically designed for the asset management side; RecommendationGUIDETM is a product that is engineered with advanced machine learning techniques to intelligently provide insights to the mutual fund distributors about their investors’ purchase behavior patterns and to retain their investments. The solution process includes multi-dimensional client clustering, identifying investor specific scheme purchase behavior, and periodic consolidated analysis reports for forward guidance. In the mutual fund industry, predictive analytics plays a key role in providing data-driven decisions for managing the resources under an AMC. The growth in the holdings by the investors decides the growth of net assets under management of an AMC, and is adversely affected by the offsets in redemptions. The attributes that trigger a redemption by an investors are complex in nature to identify and analyze. These attributes include financial transaction patterns by the investor, market conditions and sentiments, macroeconomics variables, scheme level features, and demographic factors.Predicting the redemption behavior requires sophisticated platform that can capture multiple factors that affect the redemption behavior. However, big data predictive analytics using advanced machine learning platform can analyze these massive amounts of transaction data and other time trend variables at a macro level. This platform can investigate these factors for near real-time data and can provide highly accurate predictions for the redeeming investors in the future at a particle level (investor-level). The process started by analyzing descriptively the investor transactions for the period 2013 – 2015, for different segments of the investors. 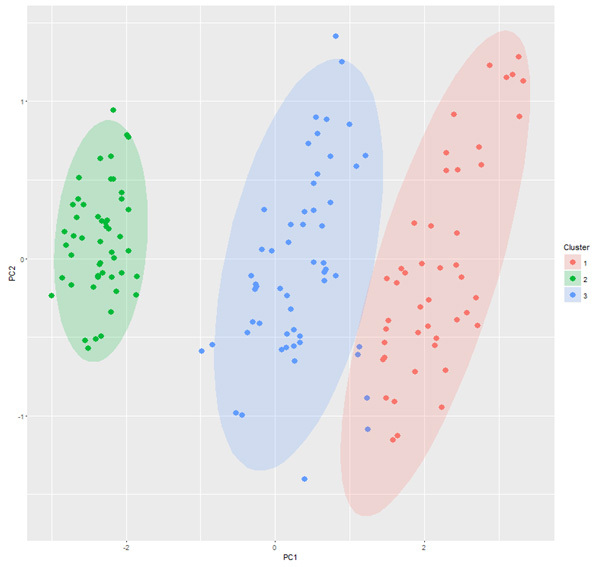 A cluster analysis was initially carried out where acluster chart is created, as illustrated in figure 1, to graphically analyze the clustering patterns. Clustering analysis identifies mathematically the closest observations or a group of observations. In this example, it identifies the closest investors on the basis of investor transaction behavior, demographic factors, and scheme and plan-level features. The three clusters represent three groups of investors on the basis of their behavioral factors. A cluster chart is a common data visualization technique used to represent similarities between the study objects by investigating the distance between these objects empirically. The next step was to analyze these observations for each cluster separately. The association between the data observations in each cluster is measured through inverse lift using Apriori algorithm. Inverse lift is a numerical representation of the probabilistic likelihood of purchasing Scheme N, when Scheme A is already held by an investor. For example in Table 1, inverse lift is a measure of investors who hold Scheme A are to purchase Scheme B. An Inverse lift of 2.001 compared to an Inverse lift of 2.004 means an investor holding Scheme A would prefer the Scheme N with the Inverse lift of 2.004 with respect to a Scheme N with Inverse lift of 2.001. These irregularities in the data were removed through preprocessing. Unsupervised learning techniques, such as associations rule learning and clustering algorithms, make no assumptions about a target data. Alternatively, they allow the data mining algorithm to find associations and clusters in the data independent of any a priori defined objective. For finding natural groupings within the data, clustering analysis on the entire data is carried out. Investors of a cluster are more like each other than they are like members of a different cluster. In our current investor data, three major clusters were identified on the basis of their behavioral factors. Partitioning algorithms: If a database has ‘n’ objects. Then the partitioning method constructs ‘k’ partition of data. Each partition will represent a cluster and k ≤ n. It means that it will classify the data into k groups. Examples: k-means, k-medoids, k-prototypes, etc. HierarchicalMethods: Thismethodcreatesahierarchicaldecompositionofthegivensetofdataobjects. Wecanclassifyhierarchicalmethodsonthebasisofhowthehierarchicaldecompositionisformed. Therearetwoapproaches for hierarchical methods: AgglomerativeApproach and DivisiveApproach. Examples: Diana, Agnes. Density-based Method: This method is based on the notion of density. The basic idea is to continue growing the given cluster as long as the density in the neighborhood exceeds some threshold, i.e., for each data point within a given cluster, the radius of a given cluster has to contain at least a minimum number of points.Examples: DBSCAN, optics. Grid-based Method: In this method, the objects together form a grid. The object space is quantized into finite number of cells that form a grid structure. The major advantage of this method is fast processing time.Examples: Sting, wave cluster, etc. Constraint-based Method: In this method, the clustering is performed by the incorporation of user or application-oriented constraints. A constraint refers to the user expectation or the properties of desired clustering results. Many data mining applications require partitioning of data into homogeneous clusters from which interesting groups may be discovered. The proposed clustering model is an efficient model for partitioning of large heterogeneous data set into homogeneous groups or clusters, with effective interpretation of clusters. As the current investor data for recommendation model building consists of both numerical and categorical variables , the traditional way of using k-means does not produce much meaningful results as many of the categorical variables are not ordered. Although the hierarchical clustering methods can handle data with numeric and categorical values, we experienced high computational cost making them unacceptable for clustering large data sets. Our proposed clustering algorithm is based on k-means paradigm. 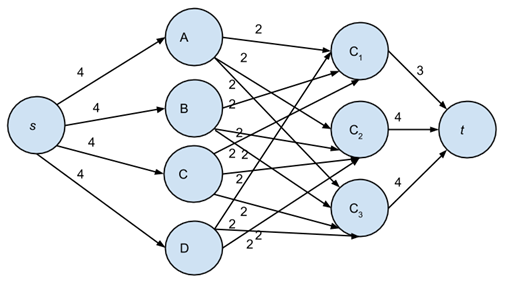 Objects are clustered against k prototypes instead of k means of clusters, we call it the k-prototypes algorithm. The clustering model is classified in such a way that k-prototypes are dynamically updated in order to maximize the intra cluster similarity of objects. The object similarity measure is derived from both numeric and categorical attributes. It uses a distance measure which mixes the Hamming distance for categorical features and the Euclidean distance for numeric features. This algorithm has demonstrated a capability of partitioning data sets in the range of a hundred thousand records, described by some 17 numeric and categorical attributes. The main objective of the recommender model is to draw the most frequent patterns out of the data. Data mining is the process of discovering interesting patterns from large amounts of data. As our transactional database consists of various influential variables such as Transactional amount, Scheme level data, segment/plan which exhibitextremely prevailing patterns that need to be identified, in the proposed model the complex problem of discovering patterns from huge database of heterogeneous data is solved using association rule based - Apriori algorithm. Apriori also has excellent scale-up properties. The model scales up linearly with the number of transactions. 1. Support: The rule holds with support (sup) in T (the transaction data set) if sup% of transactions contain XUY. 2. Confidence: The rule holds in T with confidence (conf), if conf % of transactions that hold X also contain Y. The model will eliminate any rules below the support and confidence. Karvy can act as a service provider and a reliable man power provider, running staff augmentation and also managed services for key clients. As a high-end database management provider for the Asset Management Companies, we handle a major chunk of the transaction data of these clients. By leveraging on its resource strength in analytics and data management services, Karvy can provide its clients with staffing, technical infrastructure, andin-house end-to-end service, across the delivery.